Don’t you just hate having to spend so much time working on those teeny tiny bolts, nuts, and fasteners? Sure, you could use a conventional wrench, but that takes a bit more effort and time. Air ratchets, or air ratchet wrenches, offer a quicker, more efficient means of securing and removing bolts, nuts, and fasteners. In this article, we’ll tackle the different advantages of using these tools and what qualities you want to find. Then, we will show you a few products which can help you decide on the best air ratchet for you and your needs. The drive head is heat-treated for added durability. It has a forwards/reverse motion that you can adjust with a switch. It has an adjustable exhaust. It is very budget friendly. It’s the most lightweight option, weighing at only 1.1 lbs. What is an air ratchet wrench and how do I use one? You can use an air ratchet wrench almost the same way conventional wrenches are except you put less force into it. It is because the power comes from pressurized gas. 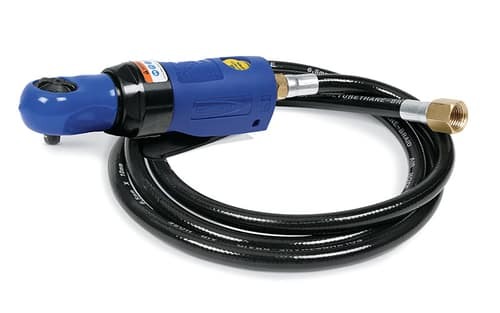 You connect it to a gas tank using a hose so it can collect pressurized air. Air impact wrench or air ratchet wrench? What should I look out for in an air ratchet wrench? The air ratchet has a trigger, a driver head, and a directional switch. You start using it by attaching the socket to the driver's head. Plugs usually come in ⅜-inch and ¼-inch variants. Afterward, you set the directional switch towards where you want the outlet to go. 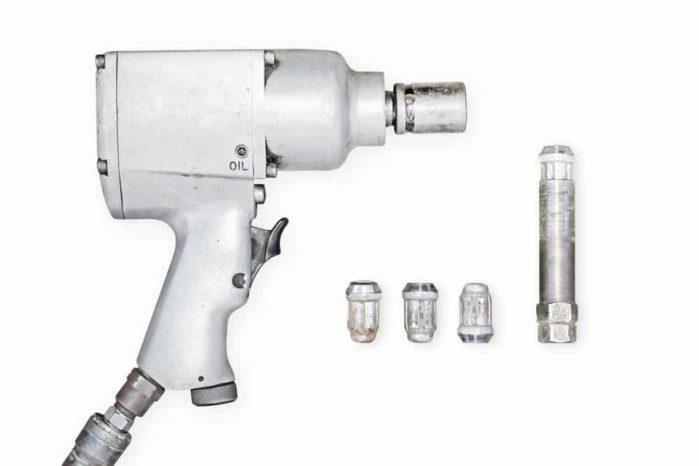 The air ratchet can loosen or tighten your nuts, bolts, or fasteners depending on how you set the directional switch. Check it before starting the air ratchet. After setting it, press the trigger to start using it. Some air ratchets have a speed trigger so you can use it at speed you deem necessary. If you’ve done some prior research beforehand, you might have seen “air impact wrenches.” They work the same way as air ratchet wrenches but look wildly different, and their utilities also differ. Both kinds have their pros and cons. Air ratchets can have lower torque. But, they run faster than air impacts. Less torque means removing extremely tight nuts and bolts may prove to be a challenge, if not impossible. Air ratchets are also typically smaller and quieter than their heavy-duty counterparts. Also, air impacts are more powerful. So, it means that they can have more torque. It’s good for when you want to remove those tough nuts and bolts, especially if they’re stuck or rusted. However, this high torque is also a double-edged sword. You also run the risk of over-torquing and accidentally stripping nuts and bolts. Think about why you’re planning to buy an air wrench and what you’re planning to use it on in the future. An air impact is larger and pricier than an air ratchet, but it can get wasted if you don’t plan on using it for heavy-duty projects. On the other hand, you might end up choosing an air ratchet, but it might not be strong enough. You might have needs that are better suited for one or the other. Each kind has their benefits and drawbacks, so it’s good to see both sides first. A higher torque means it can tighten nuts and bolts better. At the same time, it also means it can remove extremely stubborn nuts and bolts faster and easier. It is useful if they’re rusted or stripped. Be careful if your air ratchet wrench has a high torque. Keep your hands out of the way since you might trap them due to the force of the torque. Speed, when it comes to air ratchets, is measured in RPM, or revolutions per minute. 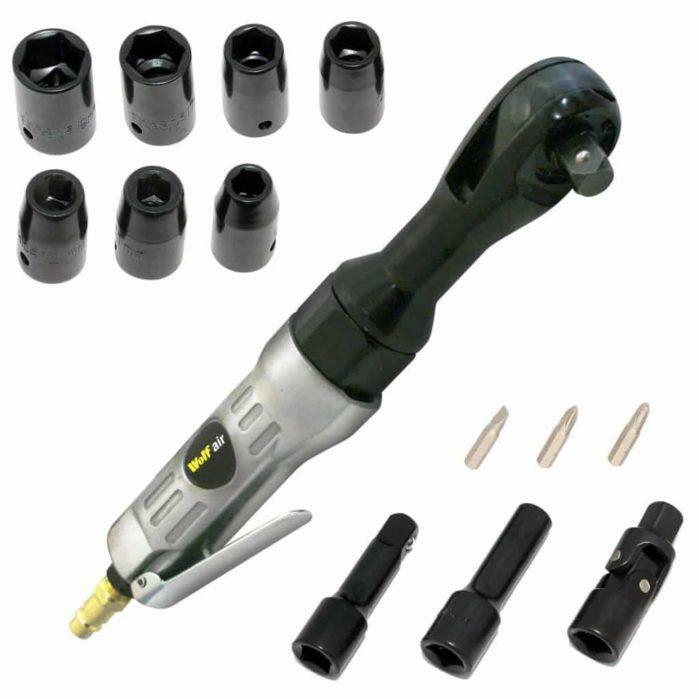 The socket rotates at high speeds to help it tighten and loosen quicker than conventional wrenches. The higher the RPM, the faster it is, which also means you’ll accomplish tasks faster, too. However, if it’s also too fast, it could be bad because you might experience backlash. You also sacrifice some control if it’s too fast because the bolt might fly off. It can cause damage or injury. Drive sizes usually come in ⅜ inches and ¼ inches. A bigger drive size means it can fit larger bolts, as simple as that. Pick one that arrives in the size you need and use more. Usually, those that come in ¼ inches are also the smaller air ratchets. These are useful for fasteners in hard-to-reach places. Since air ratchets are also mechanical, they’re also a bit pricey. Therefore, it’s only proper that you ensure that it comes with a guarantee. Getting one without a warranty is risky, but it’s not unthinkable if you like the product. The Ingersoll Rand Air Ratchet promises 55-foot pounds of torque thanks to its robust and capable motor. It also spins at 170 rpm, completing any task quickly and efficiently. The drive is ⅜ inches large and is heat-treated to ensure durability and longevity. You also don’t have to worry about this tool from slipping away from your hands while in use. The contoured handle lets you get a good grip, making it easy to use. Best of all, you’re insured with this product as it comes with a 1-year limited warranty! The ratchet head is heat-treated. The feature makes it more durable and will surely last you a long time. The contoured handle makes it sure that it won’t slip out of your hands while you’re working. The comfortable grip handle also makes it easier to use, so it’s good for first-timers. The handle trigger could become problematic as it is not made to last. This air ratchet wrench from PowRyte can quickly switch between forwards or reverse motion at the flip of a switch. It also has a power regulator which lets you do the job much more precisely. You can also switch between three power settings from full to low power. It has a maximum torque of 45 feet pounds and has a top speed of 150 rpm. The ratchet head, just like the Ingersoll Rand one, is heat-treated. You can work for a long time with this air ratchet wrench since the touch control trigger helps lessen fatigue. It has three power settings. The power settings are small, medium, and full. The touch control trigger makes it easy on the hands. It lets you control how much power you’ll use. It has a forward/reverse functionality which you can activate via a switch. The switch has a design that you won’t accidentally activate it when working in cramped spaces. It does not have a warranty. It’s a bit slower than other ratchets at 150 rpm. The AIRCAT 805-HT High Torque Air Ratchet can deliver 130 ft. lbs. of torque. It spins at 180 rpm, so you’re sure to get things done fast. This air ratchet is also advertised to be quieter than other models since it only emits 84 dB of noise. It is roughly equivalent to the noise caused by a passing diesel truck. They used the latest technology to make the ratchet head which is designed to prevent “head spreading.” The handle is contoured for a comfortable, secure grip which won’t make your hands sore for extended periods of time. To top it all off, it also has a two-year warranty! It is quieter than other air ratchet wrench models. It has a speed trigger which you can use to change the speed to suit your needs. It’s rapid response, so you don’t waste any time while working. The torque is extremely strong powerful in comparison to other products in the same price range. It has a high torque threshold, so it is, more susceptible to over-torquing. Also, it can cause stripped nuts or bolts. It can also trap your fingers if you’re not careful. This air ratchet is heavier than other brands. 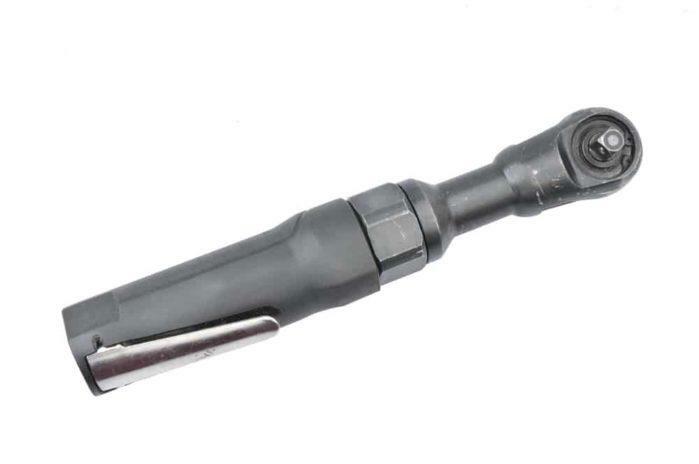 This air ratchet wrench from ACGEN is a budget-friendly option for when you need a no-frills product. It is extremely light and portable at 1.4 lbs. So you can have it ready for any situation. It has a maximum torque of 45 feet pounds and also a speed of 150 rpm. It also has a reversible motor which is a nice feature for a budget product. It is also more durable than its other counterparts because it comes with a ball and needle bearing. The ¼-inch drive is suitable for those who only need to use this for smaller bolts. It has a reversible motor. This feature isn’t typically present even in more expensive air ratchet wrenches. It is lighter than other models. It’ll give a more comfortable feeling when held. It does not come with a warranty. The drive is smaller than most products offered. It may not suit well to those who expect to use this on bigger bolts. This mini air ratchet from Neiko has a drive of ¼ inches, good for when you need to get to those smaller bolts. It’s also the lightest of the bunch, weighing only 1.1 pounds, making it preferable for working in smaller spaces. It is light weight, so it will also help you work without tiring your hand. It has a free speed of 350 rpm and a maximum torque of 30 ft. lbs. Expect to finish tasks quicker with this one! This model has a latch handle and a switch making it easier to switch between different directions while working. It’s extremely lightweight and can fit the palm of your hand. Despite its size, it has a free speed of 350 rpm making it the fastest option among all five products. It’s easy to switch between clockwise and counterclockwise thanks to its latch handle and switch. The warranty is not listed. It only has a drive of ¼ inches, which is only suitable for smaller bolts. T﻿﻿he AIRCAT 80﻿﻿5-HT High Torque Air Ratchet Wrench is the best choice. It’s built to last and has a strong torque which should serve a lot of your needs. The fact that it is quieter than other models is a nice bonus. It also comes with a speed trigger; a feature not usually seen in other models. When using this particular product you just have to take an extra precaution. It’s also heavier than other air ratchets, but this is something you’ll get used to over time. Overall, this is a fantastic product that is versatile, sturdy, and durable. Of course, we recognize that different people have different needs. If you’re on a budget, the ACGEN Portable Handheld Air Ratchet is a good choice too. If you’re looking for portability, we can also recommend t﻿﻿he Neiko 30119B Mini Air Ratch﻿﻿et. An air ratchet wrench is a great investment which can save you plenty of time and energy as opposed to using regular wrenches. So, what are you waiting for ladies and gents? Buy yours now!